The Buddhist Churches of America is the United States branch of the Hongwanji-ha Hongwanji (a.k.a. Honpa Hongwanji / Nishi-Hongwanji) sub-sect of Jōdo Shinshū (淨土眞宗 «True Pure Land School») Buddhism. The term ‘Churches’ in the name of the sect derives historically from the desire of Japanese immigrant Buddhists to be accepted into North American society and to avoid attracting discrimination, especially after many Japanese-Americans were interned during World War II. The 60 churches and temples in the BCA are located primarily on the west coast, but there are churches and temples in Utah, Colorado, Illinois, Ohio, New York, Virginia, and New Jersey. These temples have Sunday services, meditation services, Dharma schools (Buddhist education for children), and various affiliate organizations and activities ranging from cultural classes to martial arts and yoga. 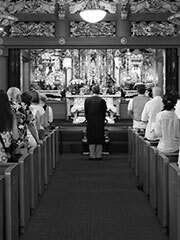 Weddings, funerals, and memorial services are conducted, in addition to study classes on Buddhism in general and Shin Buddhism more specifically. Our temples have a warm sense of community and belonging, and lifelong friendships are nurtured.